Sheffield United fought back to claim a draw against League One promotion chasers Leyton Orient. Dean Cox fired Orient into the lead after lifting the ball over a United defender and side-footing past Mark Howard from six yards. The hosts equalised after Jamie Murphy pounced on a loose ball, dribbled around Jamie Jones and tapped home. The Blades had chances to grab the three points late on, with Conor Coady and John Brayford both going close. The result solidifies Sheffield United's foothold in mid-table, while Leyton Orient lose pace on second-placed Brentford in the race for automatic promotion after the Bees secured a 3-1 victory over Notts County to open up a seven-point gap. "I was really pleased with the first hour and particularly the first half. I thought we played some excellent football. "We need to keep the belief and the focus. "Perhaps we lapsed a bit of concentration [for the equaliser] as we should've won the ball further up the field. We didn't, and then it's an individual mistake which has cost us dearly. "There are still five games to go and we'll still be playing with the right attitude, desire, enthusiasm and spirit that took us to the top of the table." Match ends, Sheffield United 1, Leyton Orient 1. Second Half ends, Sheffield United 1, Leyton Orient 1. Attempt missed. Ben Davies (Sheffield United) right footed shot from outside the box is just a bit too high. Harry Maguire (Sheffield United) wins a free kick on the left wing. David Mooney (Leyton Orient) wins a free kick on the right wing. Attempt missed. Shaun Batt (Leyton Orient) right footed shot from outside the box is too high. Stefan Scougall (Sheffield United) is shown the yellow card. Substitution, Leyton Orient. Shaun Batt replaces Lloyd James. Attempt saved. Ben Davies (Sheffield United) right footed shot from outside the box is saved in the centre of the goal. Moses Odubajo (Leyton Orient) is shown the yellow card. Harry Maguire (Sheffield United) wins a free kick in the defensive half. Substitution, Sheffield United. Robert Harris replaces Kieran Freeman. Attempt missed. John Brayford (Sheffield United) header from the centre of the box misses to the left. Hand ball by Elliot Omozusi (Leyton Orient). Corner, Leyton Orient. Conceded by Mark Howard. Corner, Leyton Orient. Conceded by Michael Doyle. Attempt blocked. David Mooney (Leyton Orient) right footed shot from outside the box is blocked. Attempt saved. Ben Davies (Sheffield United) right footed shot from outside the box is saved in the top centre of the goal. Substitution, Leyton Orient. David Mooney replaces Dean Cox. Corner, Sheffield United. Conceded by Jamie Jones. Attempt saved. Conor Coady (Sheffield United) right footed shot from outside the box is saved in the centre of the goal. Attempt saved. Stefan Scougall (Sheffield United) left footed shot from outside the box is saved in the top centre of the goal. Lloyd James (Leyton Orient) is shown the yellow card. Goal! Sheffield United 1, Leyton Orient 1. 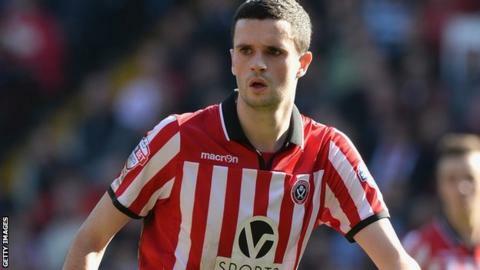 Jamie Murphy (Sheffield United) right footed shot from the left side of the six yard box to the bottom right corner. Assisted by Ben Davies. Substitution, Sheffield United. Ben Davies replaces Chris Porter.